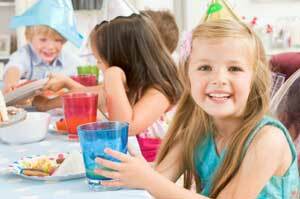 If you want to rise above simple birthday party snapshots to show really great, professional-looking party pictures, here are some tips to try, and pitfalls to avoid. 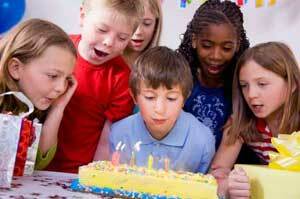 Here's how most people take pictures at birthday parties: Flash on, perhaps with red-eye reduction pre-flash, the birthday boy or girl blowing out the candles or cutting the cake, maybe a few posed shots afterwards with friends. The look is consistent, familiar, and wrong, because the straight on-camera flash produces a coal-mine effect. Unflattering light falls on the faces of the people in the pictures and the background is most likely going to be dark, even though the room is light. Who really enjoys birthday party pix that look like that? Surprisingly, just a few camera adjustments can fix the coal miner look, while a few simple posing directions can help you capture the spirit of the party. Step one is to change how you light and expose your party shots. The goal is to lighten the overall scene so it looks more natural and less like a coal mine. Let's start with what you can do with point and shoots cameras and work our way up the camera and flash food chain. First, increase your ISO to about 400 (any higher and you'll have unacceptable digital noise, even if you are only making a 4x6-inch print). Then, change your flash mode to night portrait mode. The camera will choose a longer exposure so the ambient light in the room will look brighter and more natural, while the flash will fill in the shadows. Be sure to hold your camera steady (turn on shake reduction). If you are using a DSLR with the flip-up flash, use a light modifier, such as Professor Kobre's Lightscoop ($20) or the Lumiquest ProMax Pocket Bouncer ($23), to lift and broaden the light. Use this in conjunction with the point-and-shoot flash-modifying instructions. Let's take the “blowing out the cake” shot. Most photographers worth their salt will strive to capture this one. Here's how it usually plays out: Everyone is sitting around a table, with the birthday boy or girl at the head. The cake is brought out accompanied by singing in varying keys. The candles are blown out, the picture is taken, and you're done. The resulting image, however, is the person blowing out the candles, looking either alone (being at the head of the table) or with one or two people looking on. That's a mighty lonely-looking birthday celebration, isn't it? Let's fix it. 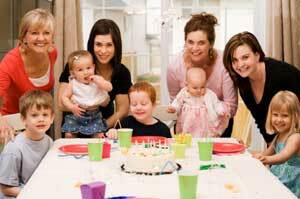 Before the cake comes out, you, as the photographer, are tasked with gathering guests around the birthday boy or girl. Have them stand behind and next to him or her, squished tightly together (which in itself can lead to some interesting expressions and moments). Now, have the cake brought out, and start shooting. Don't be shy about directing people to move so they're in the shot! Photograph the approach, the singing, the blow-out, and the cake cutting, all with people still gathered around. This is your prime time! Be sure you've locked focus and exposure on the birthday boy before he blows out the candle. That way you can avoid missing the moment due to lag time. Once the ceremonial part of the party is over, go around the table, and take a quick portrait of each of the guests. You can zoom in or not as you wish. Shooting at a “normal” focal length will produce flattering portraits while still including others and the ambience of the party in the background. Finally, there's the unwrapping of gifts...this is not only a fun photo opportunity (the expressions upon reading gag cards or seeing the gifts can be fun) but it's also a good way to document who gave what. Photograph the card with the gift. Easy. 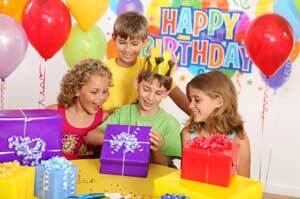 Not just child's play: Birthday parties aren't just for kids, and don't necessarily have to be indoors. 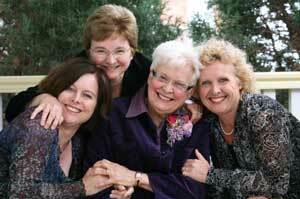 It's definitely OK to pose friends and family together with the smiling birthday girl. Just make sure the exposure is open and there aren't any bothersome shadows. Turn the flash on (not Auto) to kick light into the happy faces. This article comes courtesy of the Adorama Learning Center.